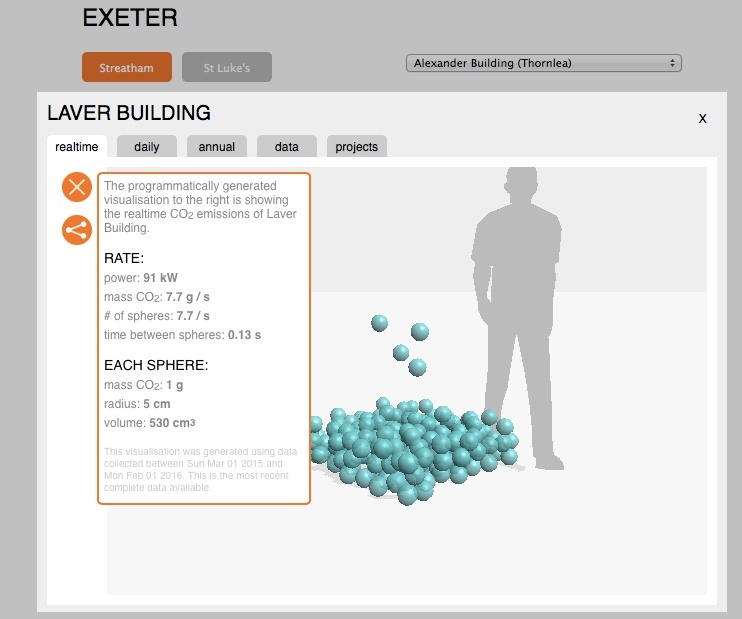 We have created a prototype tool for University of Exeter designed to engage students and others on two campuses in the energy consumption and carbon footprint of all the buildings in a non-technical and visual way. Initially sized for running on tablets, the tool runs on desk-tops and mobile phones with modern browsers and shows average real-time, daily and annual emissions, as well as energy use based on historic data. 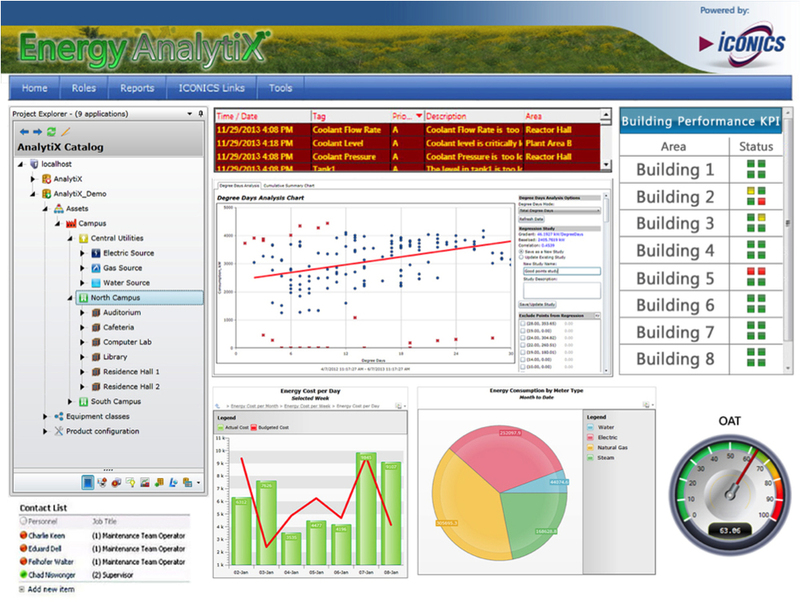 A ‘Projects’ tab allows for additional information, images and energy savings advice specific to each building. At present this tab has not yet been populated. The inclusion of social media links and image saving allows easy sharing and opens the way for more dialogue with the Estates Department. Our aim is that the tool will intrigue and engage people on every platform from kiosks positioned in high footfall locations e.g. reception areas, to students’ individual smart phones. 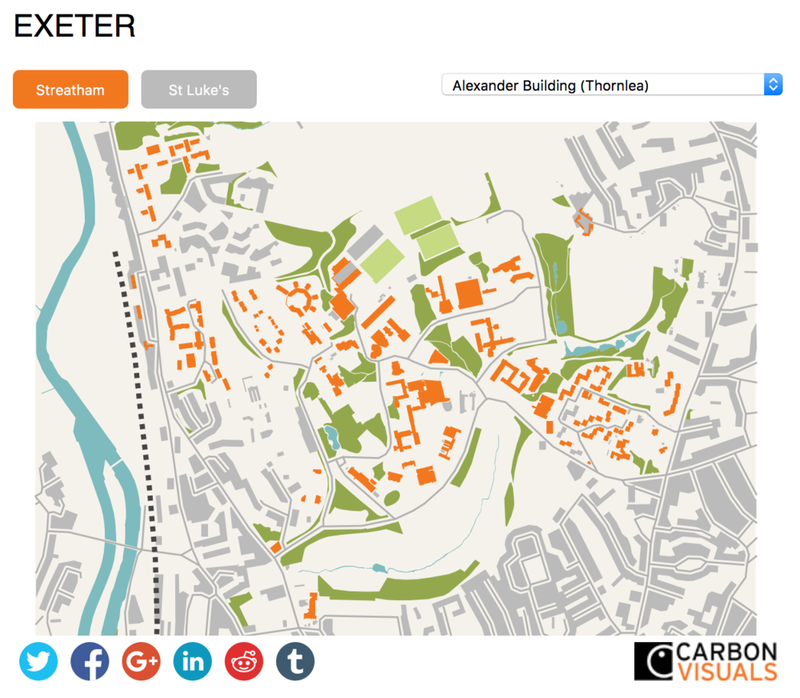 We are now looking for more UK universities that would be interested in trialling this tool on their own campuses at the same time as helping us improve this unique tool. Contributions to 2009/10 emissions from individual institutions of the Kensington 1851 estate. Time is also a very important factor in establishing the reality of data’s referents. In general we are communicating ‘rates’ rather than simple quantities – how much over how long. From a carbon accounting point of view units of tonnes per year are useful, but these units bring little insight to non-engaged audiences. Unlike a year, which is a period we understand intellectually, a day is a period we actually ‘inhabit’. We can feel a day passing, but the passage of a year we understand intellectually rather than feeling. The here and now is a particularly powerful period of time to illustrate. Showing rates of emissions in ‘real-time’ makes those emissions seem particularly real. This does not necessarily mean showing current instantaneous values for the rates (which we call ‘live’ data). If the data we are working with is a single annual figure we can show this in real-time as an average rate. Illustrating volume does provide an intuitive sense of scale. 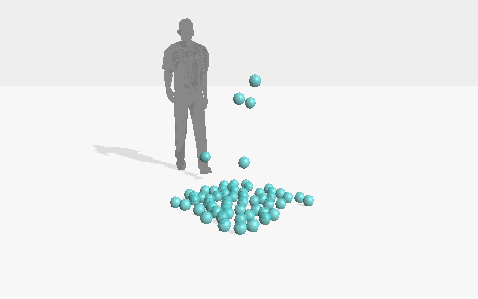 Illustrating volume as a collection of unit volumes corresponding to unit masses goes even further. One advantage of this approach is that human perception makes us quite good at intuiting value by ‘counting’ multiple objects, but very bad at judging volume visually. Breaking volumes into units helps us judge scale visually. Another advantage of this approach is that it allows us to link abstract accounting units (kg, tonnes, etc.) with an intuitive picture of ‘stuff’.